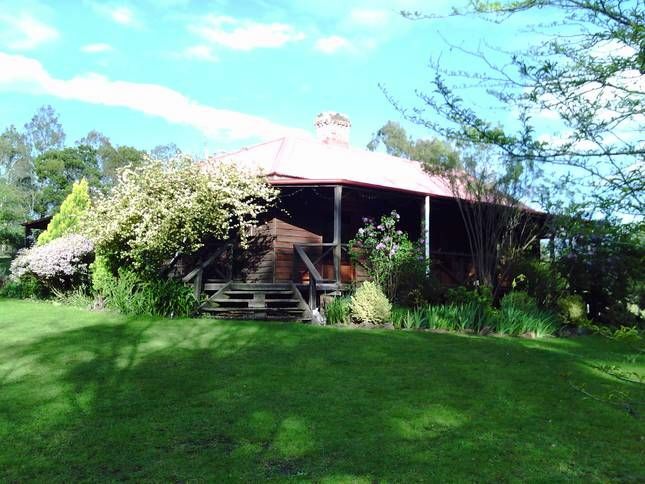 Cottage on 25 acres: native animals and birds, farm animals, dog run, gardens. HISTORIC SCOTTS HUT is absolutely charming, magical and welcoming. Built in 1872 the house features: blackheart sassafras lined walls, polished handsawn blackbutt floors, leadlight windows, stained glass, artworks, wrap-around veranda, 3 sets of french doors, quaint red roof with a brick chimney. Historic Scotts Hut is a 4 in 1 holiday destination: stay in a rural retreat, take day trips to the beach, explore the Bega Valley Shire's attractions or even take a short trip to the Snowy Mountains. 2 x queen beds, 1 x double bed, 1 single bed, fold out single bed and a portacot. All beds are made up for you with sheets, doonas, blankets and electric blankets. Lounge Room 1 - brand new leather recliner 3 seater with 2 electric recliner chairs, combustion heater, 60 inch Smart 3D TV with Clarity Ipod docking speaker system for great sound, Blue Ray DVD player with 3D movies and other DVDs are supplied for free. Free to Air Television. Lounge Room 2 - single bed, wall unit with books, board games, telephone, study desk and chair. Modern and extremely well equipped with brand new stainless steel large fridge, dishwasher and microwave, hotplate top and oven, toaster, kettle, health grill, blender and everything that a gourmet cook could wish for! Lovely crockery, glassware & cutlery. Seating for 6 persons in a fabulous setting including a chandelier! (Baby hi-chair available for free). Well appointed with a toilet, vanity, bath and shower. NEW hot water system with great water pressure installed October 2017. The house has ducted reverse cycle air-conditioning to keep you cool in summer and warm in winter. For ambiance in the winter months there is a combustion heater and wood is supplied free (within reason). 60 INCH 3D SMART TV + BLUE RAY PLAYER + DVDs to watch for FREE. Plenty of comfortable lounge chairs and outdoors dining table seats six and BBQ. Large washing machine and dryer. Scotts Hut is connected to the grid to get power like any normal home. However we now generate electricity from solar panels which is fed in to the grid. We are helping to save the planet by reducing our carbon footprint ! Plus we use environmentally friendly products wherever possible. Be a part of eco tourism by staying at Scotts Hut. Portable cot, highchair, pram, baby bath, toys, swing, 'buggy' bike for up to 3 year olds, and bike for up to 7 year old. There is plenty of space to run around, farm animals to feed, wildlife and loads of fresh air. We consider your pets to be part of your family and we welcome your pets ! We two dog runs for your dog's safe keeping and a fenced house yard. Plus well behaved dogs are permitted in the house (with supervision). We will send you maps & information about 'leash free' areas, take your dog for an adventure in the Bega Valley Shire. Dogs must arrive clean and with a flea collar or be treated for fleas. Please note: Scotts Hut has upgraded the dogs runs for your dogs comfort and security. The new dog run and kennels cost over $7,000. The run is 5.5 metres long by 3.6 metres long which is huge. It has a cement slab, a full covered roof and 1/4 of the run is a walled kennel the rest is steel meshed. Your dog is protected from the wind, sun and rain. When you go out to have fun your dog will not escape and will be very comfortable in this spacious area. Is perfect for those who wish to just unwind in a most relaxing and peaceful environment. Fruit trees, native and european decidious trees, flowers and herbs. Enjoy plenty of space in the houseyard and play a game of cricket or boules or take it easy on the day bed on the verandah. The property is an ideal retreat for those who love nature. Feed the farm animals: cows. View native animals kangaroos, wombats, possums and huge variety of birds. Listen to the delightful birdsong and smell the fresh air and fragrant blooms. Avoid the crowds and noise of the busy tourist spots. Stay at Scotts Hut and enjoy the peace and tranquility that it offers. Scotts Hut is surrounded by farmland, National Parks and State Forests. The property is a 25 minute drive to the coastal beaches of Pambula and a 30 minute drive to Merimbula. Take advantage of the great attractions and events of the Bega Valley Shire. Bega (north), Eden (south), Merimbula (east), Bombala and Snowy Mountains (west). SUMMER: relaxed moments on the verandah. Enjoy the scenery and birdsong, take a nap on the daybed, read a book at leisure. Take a car trip to local tourist destinations including the many beaches. Kick a ball or play cricket in the houseyard. Feed the farm animals. Swim in a 50 metre pool at Candelo. AUTUMN: deciduous trees change colour and blow in the breeze. Tour the Bega Valley Shire and its many wonders or kick back and enjoy the 3D TV with DVDs supplied. Ramp up the combustion fire and listen to your ipod music on our great speakers with ipod docking station. WINTER: combustion fire, cook yourself a roast dinner with a glass of red wine and enjoy a movie, read a book. Take a day trip to the Snowy Mountains (1.5 hours to Jindabyne). Or tour to nearby National Parks and State Forests for bushwalking. SPRING: watch the vibrant fresh new growth in the garden as this season brings life to the decidious trees! Magnolias, daffodils, pink and white bloom on the fruit trees. Whale watching at Eden. Facilities include: tennis courts, skateboard park, children's playground, sports ground, other historic buildings. Picnic tables over looking Mt Jingerah and a River Walk on the outskirts of town (take a dip in the creek) and a Historic Buildings Walk. The owners of the general store are friendly and very helpful to Scotts Hut visitors with local information. The general store has a cafe, internet, fax, photocopier, post, petrol, general groceries and organic fruit, veg and meat. Enjoy a gourmet breakfast or lunch. Prices are reasonable and the staff are friendly and know how to make a decent coffee!!! Whilst you stay at Scotts Hut treat yourself to a meal at the Wagtail Cafe afterall you are on holidays! Open Monday to Friday 8.30am to 5.30pm and Saturday 8.30am to 12.30pm. Crystal clear, sapphire blue 50 metre swimming pool, solar heated, large covered shade area with lawn at Candelo (15 min drive from Scotts Hut). This pool has 8 lanes and a shaded baby swimming area. Open September to April. A truly fantastic swimming pool that is never crowded. This must be the best keep secret in the area! Book a relaxation or theraputic massage, essential oils, reiki or bach flower therapy with Debbie. Book an appointment with a Herbal Therapist with Neville Dunn and Lynne Gardner. Candelo markets on 1st Sunday of the month. Pambula markets on 2nd Sunday of the month. Merimbula markets on 3rd Sunday of the month. Wyndham Markets on 4th Sunday of the month. Maximum number of Guests is 6 persons including children. The care taker lives on site away from the main house to maintain the property and land and to assist guests. Peaceful , calming, comfortable. Enjoy the magnificent scenery while walking amongst the trees. Wildlife every where you look , listening to the birds is wonderful. Scotts Hut has everything you need for a wonderful stay away from the stress of the city. We took a long lead so our dog could walk around the verandah. We enjoyed the complete privacy. The hut is very rustic, absolutely gorgeous. Our stay was wonderfully peaceful. The verandah was a wonderful spot to spend a couple of hours just chilling out. The only downside was the driveway in, we found it a bit rough. Thanks for your feedback Virginia. The short distance of driveway that is a bit rough is scheduled to be repaired. Everything you could want has been thought of and provided. We really appreciated that the fridge contained a litre ofmilk ready for our arrival. We chose this property because it is dog friendly and we weren’t disappointed. The kennel and run provided a secure place to leave our dog when we did not want to take her with us. Information on dog friendly beaches and parks was available for reference. Nice in nature. Well organized house. Good for everyone including dog. Safe to keep dog. I love staying there. Everything is nice.